As mentioned a few days ago, Valery Hronusov, from Russia's Academy of Science, and his associates have been working on a side project to provide an amazing new visualization tool for aviators. 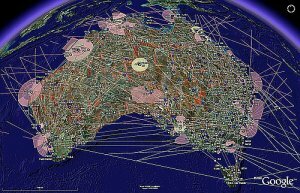 They have used their KMLer application (which allows you to process GIS information and create powerful visualizations in Google Earth) to create a Global Aeronatucial Information System. There is a huge amount of data buried in their AIS network links . In fact, you should watch out how much you turn on at once as it will quickly slow down your computer if you load too much at once. Included are high and low altitude airways (highways in the sky), runways, lighting systems, navaids, and much more. Apparently, Valery's team has done this on behalf of Global Imaging who are the source of the large Oracle database which contains the data. Here is their new web site for the GE version of the system they call: e:AIS. This is probably the largest databases made available in full visual form in Google Earth to date (other than Google Earth's own data of course). At the heart of the system is an Oracle based Aeronautical Database (AISDB), organized according to the EUROCONTROL Aeronautical Information Conceptual Model (AICM), which stores feature data including Aerodromes and associated runways, services, lighting systems, and obstacles, Airspace, Navaids, Significant Points, and Routes. More details. I would like to know how to get polygons to float off of the terrain at a specified height. How did Valery's team do that?